By MrSydasien in NSAN NÈWS on 8 January, 2019 . Today it is holiday here in Bengal. Netaji Subhas Chandra Bose’s birthday, the mayor of Calcutta who competed with Gandhi for the leadership of the Congress Party and eventually led the Indian National Army (INA) in the war against the British. He is much more popular in Bengal, with its traditions of armed struggle, than Gandhi – think what you want about it. But up to Tagore’s fame none of them reaches. INA’s fighting songs are now sounding out loudspeakers on our street and all day long. In the afternoon home to Bumbi (Abanti) and her husband at Salt Lake BH block, still a little peaceful area, like the whole of Salt Lake (Bidhan Nagar) was like in 1982. Excellent Bengali lunch and a relaxing afternoon, watching photos from their beautiful summer house in Himalayas. Boni and rana with us, Tutu and Tuki were also there. Oxford Book shop visit by Marie and me. Bought two books, Wlliam Dalrymple’s Return of a King. An Indian Army in Afghanistan, about the Anglo-Afghan war in 1839-40, and the second book Cory Taylor’s How Hitler Was Made, about the period 1914-1923. Republic Day. At 8 AM Republic Day celebrations at Loreto House Convent school in Kolkata. Marie and I went there on invitation by the proud dance teacher Munjini. The theme for the programme: Indian Army. Rest of the day visiting relatives. Wonderful lunch at Munjini’s house and equally delicious dinner at Bouddhu’s house at Dhakuria, celebrating Rikhia’s birthday. Tata Steel Kolkata Literary Meet 2019. Six days of extraordinary events with leading Indian writers and intellectuals present, interesting book seminars, film shows, music concerts, most of it taking place around Victoria Memorial. And me ignorant fool did not know about it until today, last day…A few glimpses here. The two brothers Nandy, Ashis and Pritish, in conversation with Rajdeep Sardesai. Kishwar Desai’s book Jallianwala Bagh, 1919: The Real Story discussed by Professor Sugata Bose in conversation with Priyadarshanee Guha.Seminar held in front of Warren Hastings statue which gave a weird impression. 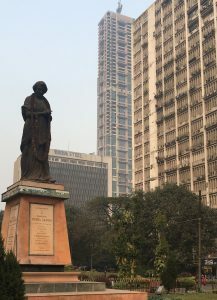 Even if the statue tries to show that he was an enlightened colonial British administrator adviced by both Hindu and Muslim wise men his main mission as first Governor General was to secure British control over India. Professor Rudrangshu Mukherjee, chancellor for Ashoka University, presented his new book Twilight Falls on Liberalism in a discussion with Ashis Nandy, moderated by Dr. Krishnan Srinivasan with Swedish connections – he has been research fellow at the Swedish Collegium for Advanced Study (SCAS) in Uppsala and in 2013 i invited him for a SASNET seminar in Lund. Before that meeting with two Swedish friends currently in Kolkata. Susanne filmmaker from Malmö, working with Talat, and the violinist Filip .They both came to our house at 10 AM and we had tea with Bubu. Then I took them for a nice walk down to the lake, Rabindra Sarovar. Nice discussions. Finally lunch at Marco Polo restaurant at Sarat Bose Road. Lunch visit at Suranjana Ghosh’s place in Patuli. First time I meet Suranjana, the well-known excellent Tabla performer based in Uppsala but with her roots here in Kolkata. Wintertime she often brings students from Sweden, and now it is Filip who gets a chance to learn the art of Tabla playing in a traditional manner in his guru’s house. Taxi from home, but took the metro back since the station was only a few hudred meters from her house. Also met her husband Kishore, and enjoyed a nice lunch. Finally a chance to again meet my friend Sabyasachi Basu Ray Chaudhuri, Vice Chancellor at Rabindra Bharati University. Last year we organised a seminar for Lars Gerdmar on Iconic Art at the university’s BT Road campus, now we met at the original Jorasanko downtown campus, where Bubu once studied Music. Sabyasachhi had a wish to meet both me and Bubu and invited us to see the daily sound and light show outdoors the old Tagore family palace. The excellent show started at sunset after 17.45, but till then we were sitting in the VC’s office drinking tea from clay mugs and I was updated on the latest news regarding the university. Most interesting is the fact that a new campus will open in New Town. Ritayan Chatterjee also came to Jorasanko, and after the show he followed us back to our home, took a Uber taxi from the congested area round Jorasanko. Flight Kolkata-Chennai at 15.05 by Spicejet and got some preferential treatment since we had paid a little extra for Spicemax service. Received by car belonging to M S Swaminathan Research Foundation Institute and were driven to its guest house in an area full of institutions. Including IIT Madras. Venkatesh Athreya arrived after some time and since the guest house restaurant was closed he took us to the neighbouring UNESCO Madanjeet Singh Centre for South Asian Journalism 5 minutes away, where we were served South Indian vegetarian dinner. Met Sucha Singh Gill who arrived late last night, and being the only other Memorial invitee staying at the guest house. When Venkatesh arrived we jointly went to the same place as where we had dinner yesterday. Met a nice British journalist from BBC in London who is teaching at the Madanjeet Centre, coming to Chennai regularly. Relaxed day before the event. Amala, Göran, Miriya and Dipak arrived shortly before the Memorial, came to see us in our room. The Memorial took place in the Institute’s main building. Staffan Memorial at M S Swaminathan research foundation at 15.00. After an introduction by Venkatesh, first speaker was N Ram, editor-in-chief for the Hindu newspaper, and a long time admirer of Staffan’s research work in Tamil Nadu. Then followed by Prof. Sucha Singh Gill from Centre for Research in Rural and Industrial Development, Chandigarh in Punjab, research colleague and a close friend of Staffan. After him followed speeches by Staffan’s Tamil Nadu research colleagues, among then naturally Venkatesh but also R Vidyasagar, A Rajagopal and Dr. Kasturi who knew Staffan ever since the 1960s. Prof Dipak Malik and Dr. Miriya Malik from Centre for the Study of Indian Languages and Society, Varanasi., also attended the event, and Dipak held an emotional speech on Staffans great personality. I read out my article on Staffan’s life and our years of collaboration, focusing on Staffan’s great work with SYDASIEN magazine and Swedish South Asian Studies network (SASNET). Our friends from Helsingborg, Amala and Göran Frankel also came for the memorial, from their winter house in Mamallapuram, south of Chennai. Göran held a speech on Staffan’s unending energy. An emotional Tagore song performed by Bubu put an end to the great memorial meet. Sucha left back for Punjab in the morning. We had breakfast all on our own and in our own guest house, since the kitchen opened today. The Memorial was covered as a news article in today’s The Hindu, short but quite good. After lunch we hired a car and went for a limited sightseeing tour of Chennai,, first to an amazing clothes supermarket in 12 floors, ground floor dedicated to ordinary sarees. Next floor exclusive wedding sarees. One floor for men’s shirts. Bought a few sarees and shirts, including a beautiful blue shirt for me. Then to Marina Beach, Chennai’s pride. Nice as usual to dip our feet in the Ocean water. Return flight from Chennai to Kolkata 9.30-11.30. Stay at Tala Park overnight. Took an Uber taxi straight from airport and enjoyed good food, both lunch and dinner. Marie arrived from Lake Market. Slept in the main room at Tala Park like som many times before. Stayed till about 3 PM. Took a nice walk in the park. Invited to a concert with Subrata Manna and Sudokshina in Behala, but declined to go. Johan arrived from Samtse by train in morning. That time I had already been to blood test at Southern Avenue with Marie (as preparation for a CT scan on Thursday). I last met Johan in Gothenburg in the fall. Thereafter it turned out to be impossible for him to invite me, Bubu and Daniel for a visit to Bhutan during the national day celebrations/50 years anniversary of SCE in December, as originally planned for, due to the vist of the king and his entourage then. However, Johan promises to try for a new invitation in the coming year. Because of the king’s visit and the great interest he put in Johan being a foreign music teacher speaking the language and knowing the Bhutanese folk songs, Johan’s position has been strenghtened. I had to make a second blood test two hours after breakfast and this time Johan accompanied me. And we continued to walk along the Lakes, passing the Buddhist temple, crossing Dhakuria Bridge and all up to Jadavpur University and Professor Mridul Bose, my old friend ever since Staffans and my visit to Jadavpur in 2005, as part of a successful month-long SASNET contact journey to Northeast India, Bhutan, Nepal and Bangladesh. Mridul invited us for lunch in the university restaurant, and took us for a tour around campus, well-known to me but first time experience for Johan. Mridul also demonstrated his plasma research at his office. Expedition Colonial Towns in Hoogly district. 2019 friends tour to the colonial heritage towns along the Hooghly River + Bansberia Hindu Temple inspired by Russian architecture. Portuguese Bandel with church and Imambara; Danish Serampore; Dutch Chinsurah; and French Chandernagore. Staying at Aquatic Hotel in Kalyani. Train from Sealdah station at 08.30 (Johan and I arrived three minutes before the train was supposed to depart, due to congestion in traffic, but Mridul and Ritayan had bought tickets and reserved seats), and at destination after one hour continued by electric scoter 2 km to the hotel, and enjoyed a light lunch before we went on Hooghly tour. Participants: Professor Mridul Bose, Dept. of Physics, Jadavpur University, Dr. Johan Westman, Samtse College of Education, Bhutan, Dr. Ritayan Chatterjee, Heritage Institute of Technology, Kolkata, and myself ex-Lund University employee. First stop Bansberia town close to Hooghly river with the impressive Hanseshwari Kali Temple from 1818 reminding of a Russian Orthodox church, and beside this the Ananta Basudeba terracotta temple reminding of a Georgian church. Second stop: The Basilica of the Holy Rosary commonly known as Bandel Church from 1599, built by the Portugese. In 1988, Pope John Paul II declared the sanctuary a minor basilica. Around the middle of the 16th century, the Portuguese began using Bandel as a port. During or around 1571, they were given permission by Akbar, the Mughal emperor, to build a town in Hooghly. The legend then tells of the siege of Hooghly, how the resident Portugese were taken prisoners by Mughal emperor Shah Jahan and they were supposed to be killed by elephants, but how they miraculously survived and were allowed to return to Bandel. Third stop: The spectacular Hooghly Imambara close to Bandel, a Shia Muslim congregation hall and mosque from 1861, located just by the riverside. Fourth stop: A Dutch monument in Chinsurah. In 1656 the Dutch erected a factory here, used as a base for the Dutch intra-Asian trade in commodities such as saltpetre, spices, cotton and indigo. In 1825, the Dutch ceded Chinsurah and other possession in India to the British, in exchange for the British possessions in Sumatra. Fifth stop: Chandernagore. French East India Company bought this place from the Mughal subahdar in 1688 to build a factory. It was a French colony administered from Pondicherry till 1951 when the charming city was officially ceded to India, and de jure transferred into the state of West Bengal in 1954. With a broad riverfront footpath so typical of the French Riviera. Final stop: Serampore or Srirampur, part of Danish India under the name Frederiksnagore from 1755 to 1845. Famous for Serampore College. I was here with Bubu, Miriya and Dipak in December but it was nice to revisit. And have some food at the the Danish Taverna. Unfortunately St Olavs church, renovated by a team of Indian and Danish architects, was not open today. From Serampore quick return by our hired car (3 200 rupees for a day) to our Aquatic Palace Hotel in Kalyani after seven hours of sightseeing tour along the Hooghly Time for beer, dinner and nice evening together. I showed the others photos from m previous visits to Bandel in 1988, and to Serampore in December 2018. All among my collection of 70 000 photos lying in the Cloud.